There are so many excellent recordings of Mahler 1 to choose from nowadays I think it’s virtually impossible to come up with one or two stand out versions. It’s been a very lucky symphony in the recording studio. People will have their own views on how the work should be performed and from this personal standpoint they develop their own allegiances. My list boils down to three. Childhood memories linger so I still have a soft spot for the first version I owned - the fine sounding Boult/LPO on Everest. Alongside this I hold a torch for the razor-sharp and neurotic Solti/LSO (Decca) and the more sober, meticulous Horenstein/LSO (Unicorn). Each is totally different in approach but all are equally valid and compelling as interpretations. This new recording from Baltimore has immaculate orchestral playing to commend it along with a feeling of discovery. Alsop’s sound-world captures not only the hothouse forte passages but also those quiet, chilling moments. Tension never slackens for a moment and this is where the technique of using live concert performances has certainly paid dividends. Before talking further about the music I must immediately congratulate Tim Handley on his fine recording. It’s smooth and clear without being bright and it’s set back in a believable acoustic. At no point does it tire the ear and the tonal depth is just right with the brass having presence without dominating proceedings. For a live recording the absence of audience noise is remarkable. Most importantly the string tone is full and sweet. 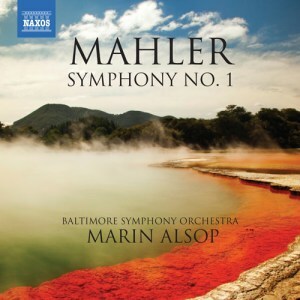 Moving onto the general style of the music-making, the string sound that Mr. Handley has captured is crucial because Marin Alsop gives us an interpretation that showcases the strings rather than blowing us away with loud percussion and raucous untamed brass. It’s just about the most gentle, romantic and beguiling Mahler 1 I’ve ever come across. Indeed, it’s so far away from Solti’s approach that it sounds like a different piece. With Alsop there are no histrionics and the playing is as smooth as silk. It’s a really unusual, different approach and it’s delightful to hear. The orchestra is in spectacular form. The intense atmosphere is set immediately at the opening of the first movement with woodwind, violin harmonics and horns in perfect proportion. The off-stage trumpets really are off-stage, maybe too much so. You need to play this at a relatively high volume to get the full impact. The passage that runs from 8:00 to 11:00 is as eerie as anyone could wish. The music hovers in stasis - Havergal Brian-like, of all things! - as woodwinds, harp and cellos search for a resolution. The bass drum is as menacing as you could ever imagine and its deep, subtle thump is very realistic without the need for any artificial boosting. This is spine-tingling, hushed playing of the first order. Once the resolution arrives the music moves on to a controlled climax. The second movement In Full Sail doesn’t set off in full sail at all. Instead we are treated to a heavy-footed Klemperer-like ländler with a relaxed, lilting central section beautifully delivered, especially by the string section. It’s an unusual approach but rather compelling: by way of an analogy think of Klemperer’s Beethoven Pastoral, third movement. At the opening of Mahler’s third movement the Frère Jacques theme is given by what sounds like the double bass section rather than by a single double bass. It’s maybe one place where a little help from the engineer might have helped. It’s set well back. This is a fairly minor point in the scheme of things. Yet again, the strings really shine and Marin Alsop relishes those schmaltzy moments, pulling the phrasing of the music around in a musical and loving way. The pianissimo passages really tell and add electricity to the interpretation. In the finale the brass section is finally given its opportunity to step forward and they really deliver the goods. The trumpets, tuba, braying horns and tam-tam are thrilling in their impact. There is no distracting applause at the end of the symphony, thank goodness, and this allows for a few seconds thought before realising what a cracking performance has just taken place. Even if you own multiple versions of Mahler 1, I urge you to give this one a try. It’s refreshingly different and is supported by engineering of superior quality. A fabulous CD.